Left: Poh: We have strong shareholders, so I don’t think we will have any issue raising capital. The challenge is to find something interesting to buy. IRIS Corp Bhd, which expects to turn in its first annual profit in four years in its current financial year, is on the acquisition trail, looking for partners that will complement its core trusted identification (ID) business. “We’re ready to throw away our ego and buy into businesses that are related and adjacent to our core business. The acquisitions must make sense and add value to the business,” president and group managing director Datuk Paul Poh Yang Hong tells The Edge. “Today, we still say yes, we are very proud of what IRIS has developed internally but instead of producing 90% of our products in-house, we might reduce that figure to 40%. We can source the remaining 60% of the technologies from outside and assimilate them. IRIS was once touted as one of the most promising technology companies, having pioneered the world’s first electronic passport solution. However, it suffered a major blow when it lost a RM318.75 million home affairs ministry contract to rival Datasonic Group Bhd for the supply of MyKad and consumables in December 2015. This, say critics, prompted its push into environmentally friendly farming solutions, renewable energy (RE), industrialised building systems and education, which resulted in losses. Since 2017, following a private placement that saw the entry of Poh and Datuk Rozabil Abdul Rahman — via their private vehicle Caprice Development Sdn Bhd — as new shareholders, IRIS has been divesting non-core assets, such as its education and RE divisions, and concentrating on bolstering its core business of trusted ID. Poh, who assumed his current post in the company on June 14 last year, has since taken over Rozabil’s shares via Caprice, leaving the latter with a 4.275% direct stake in IRIS while Poh holds a 14.71% stake. The divestment seems to have worked. Combined with writing off total debts of RM420 million in the last two financial years, it has resulted in the group turning in three profitable quarters in this financial year ending March 31, 2019 (FY2019). For the cumulative nine months ended Dec 31, 2018, IRIS posted a net profit of RM18.04 million — reversing a net loss of RM54.98 million suffered a year ago — despite a 29.8% year-on-year decline in revenue to RM193.89 million. Valued at RM415.28 million at last Thursday’s closing, IRIS shares have lost more than 76% of their value since 2014. Poh says the group recognises that “much more work lies ahead. We need to win back the trust of the market but we are cautiously optimistic that we will return to the black in FY2019”. The group’s gearing ratio stood at 53.93% as at end-FY2018, down from 63.02% the year before. Total borrowings stood at RM142.46 million as at Dec 31, 2018, while its cash and bank balances totalled RM41.14 million. “We have strong shareholders, so I don’t think we will have any issue raising capital. The challenge is to find something interesting to buy,” says Poh. Apart from Rozabil, who is also group CEO and president of Destini Bhd, other major shareholders include Berjaya Corp Bhd CEO Datuk Seri Robin Tan Yeong Ching with a 9.02% direct stake, and Felda Investment Corp Sdn Bhd, which had trimmed its stake in IRIS to 4.95% as at Feb 26. According to IRIS group CEO Shaiful Zahrin Subhan, the divestiture of its non-core assets is 80% completed. “We have disposed of the major non-core businesses that have been bleeding the company dry. There are a few non-core assets to dispose of, which we should be able to complete in the next couple of years. Having said that, there will be no fire sale of assets,” he says, adding that these assets include Plaman Resources Ltd, which is involved in mining activities in New Zealand. “We are also actively discussing with the state governments to hand over Rimbunan Kaseh (farm management) projects around the country,” says Shaiful. Shaiful says IRIS is looking to secure contracts in Africa, Asia and parts of America. Today, the group has a presence in 34 countries. “Of course, we are keeping an eye on the local market as well, which currently makes up less than 10% of the group’s overall revenue — a ratio that we want to address given the opportunities,” he says. According to an Oct 16, 2018, report by The Edge, IRIS was vying for an upcoming contract, valued at about RM300 million, from the government to supply raw MyKads to the National Registration Department at the end of this year. Shaiful confirms that IRIS is keen to participate in the tender, should it be called. “In terms of technical know-how and abilities, we have no doubt that we’ll be able to compete with Datasonic. Yes, this company (IRIS) was distracted a few years ago. While we have lost (the MyKad contract) in Malaysia, we supply e-passports to West African countries like Senegal, Guinea and Nigeria. “If you look at our software and project management teams, they are largely intact. All the competence and skills that delivered the world’s first e-ID and e-passports are still here. We have not lost them all, although some have left to [join] Datasonic. We have reorganised our staff to help them refocus and grow the group again. 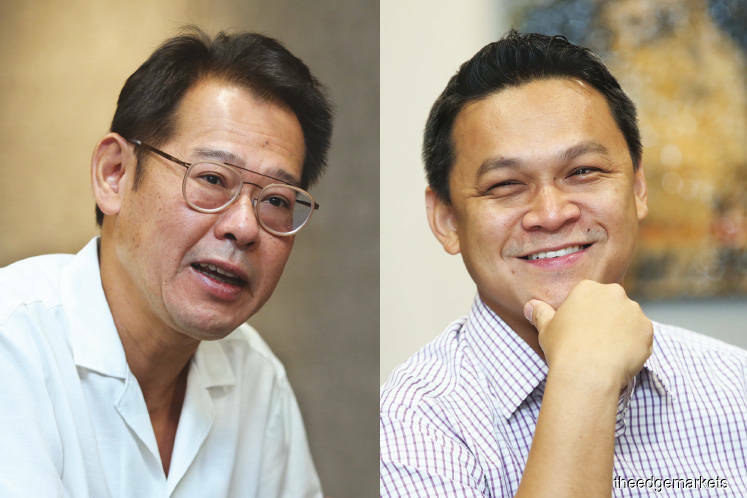 We still engage IRIS co-founders Datuk Tony Lee and Chas Yap as technical advisers. We have a friendly relationship with them,” he says. On March 23, IRIS will unveil a new logo as well as a five-pillar strategy to coincide with its 25th anniversary. “The strategy will outline our direction for the next five to eight years,” says Poh. “The aim is to be one of the leading players in the trusted ID industry on a worldwide scale,” he adds. Already, according to SBWIRE’s Market Research Future Report released in October last year, IRIS is among the top 10 key players in the global e-passport market. IRIS has an order book of RM2 billion, which will keep the group busy for the next five years, says Shaiful.